A 12-inch teddy bear made of golden milled silk..
After WWII, mohair was in short supply in Germany, requiring Steiff to use alternative materials.That's when Silk Teddy Baby was born. Instead of mohair, the coat of Steiff's reproduction is a rich, golden silk milled especially to match the color and texture of the post-war original. Like his predecessor, he features a squeaker and is five-way jointed. Friendly pupil eyes, a hand-stitched nose and airbrushed details really bring this fellow to life. 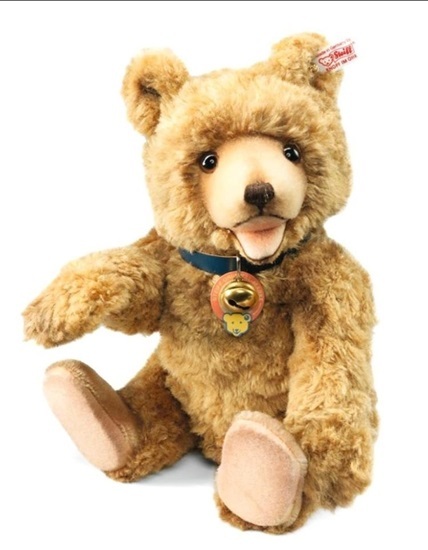 “Silk, Teddy Baby” is12-inches tall and wears a genuine leather collar that is finished with an antiqued brass bell. His chest tag has also been recreated to match the original1948 design. No Steiff collection would be complete without this classic bear,here is your chance to own a truly unique piece of Steiff history.